Cinema and variety theatre, built 1926 by Robert Rittmayer & Furrer for Othmar Bock. Opened 18 Dec 1926. 1700 seats. 1982 conversion to a multiplex cinema (four halls with 484 seats in all). Closed9 April 2007. Subsequently converted to a commercial building. 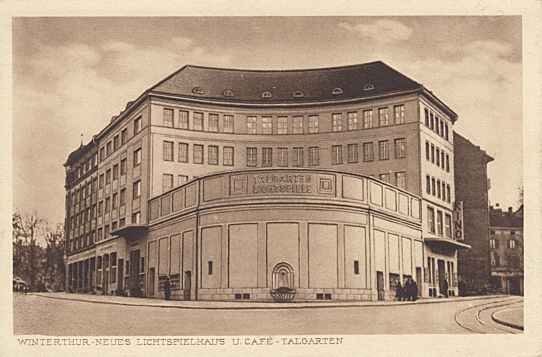 Front Text: "Winterthur,Neues Lichtspielhaus u. Café - Talgarten", inscription: "Talgarten-Lichtspiele"